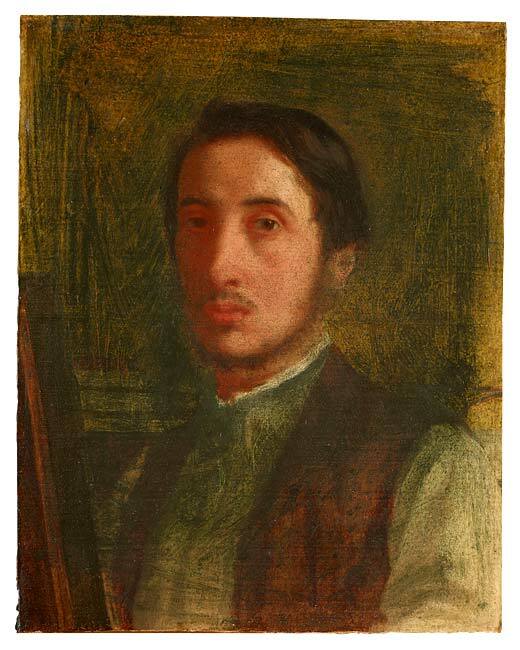 Self-Portrait in a Brown Vest, 1856. A great work of art, whether painting, sculpture, literature, poetry, or play, always appears complete, seamless, and effortless. The spectator knows that the artist spent countless hours perfecting the piece, but that hard work never shows in the end result. The illusion should be that the work is a perfect jewel, polished to a high sheen with no hints of early rough cuts, drafts, sketches, corrections, or improvements. The viewer should see the great and powerful Wizard of Oz, without any glimpses of the man behind the curtain. 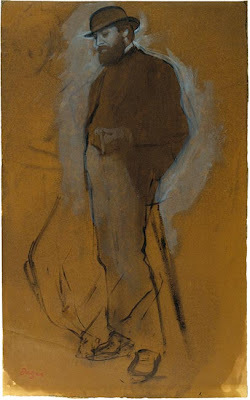 Standing Man in a Bowler Hat, ca. 1870. Oil paint thinned with turpentine, on brown paper. The New Orleans Cotton Exchange, 1873. But seeing the handwritten manuscript, the first draft with strike-throughs and erasures, or the rough sketch can make us appreciate all the more a finished work that has become so iconic it is almost taken for granted. 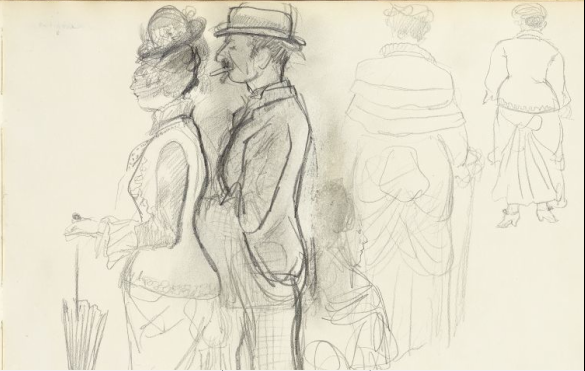 The Morgan Library and Museum has mounted a small exhibition consisting of two rare books of sketches and twenty works on paper by the great French Impressionist, Edgar Degas (1834-1917). This show is an extraordinary opportunity to see a great master in the process of creating his work, although nearly a century has passed since his death. Three Studies of a Dancer, ca. 1880.
heightened with white chalk, on blue paper faded to light brown. Little Dancer Aged Fourteen, 1880-1, cast circa 1922. 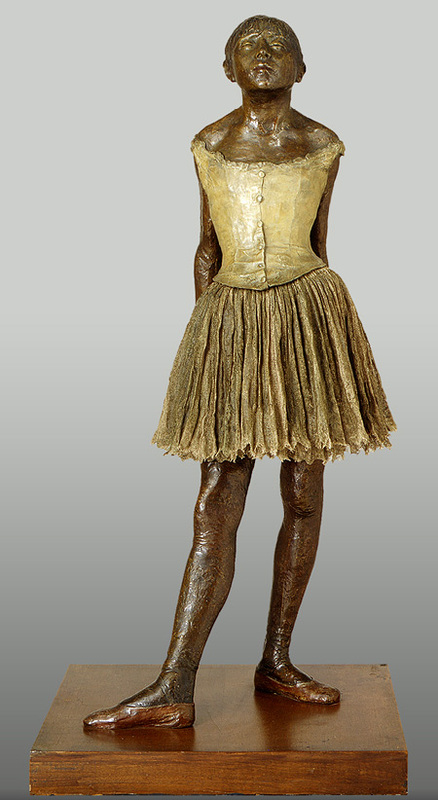 Painted bronze with muslin and silk. 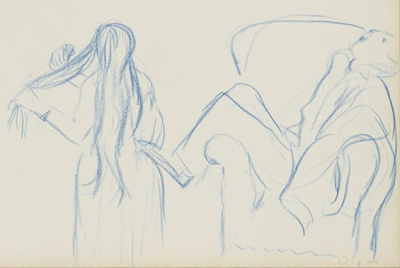 These preliminary studies can be easily recognized as the raw material for some of the artist's greatest and most famous oils on canvas and bronze sculptures. They offer insight into the mind of Degas, the way in which he painstakingly observed his artistic subjects, and his ability to recall and recreate scenes he first recorded years before they finally reappeared in his finished works. Four Jockeys on Horseback, ca. 1868, reworked ca. 1878. Graphite, with stumping, on tracing paper mounted to board. 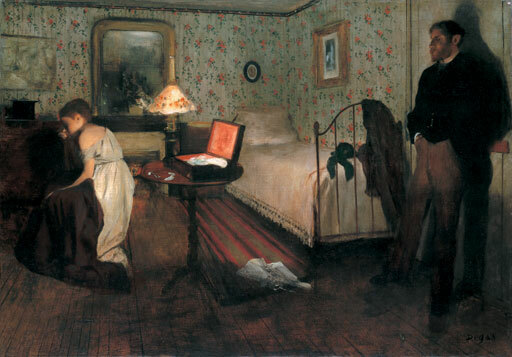 Degas was always a man apart from the rest of the Impressionists. His sensibility was darker and much more detached. 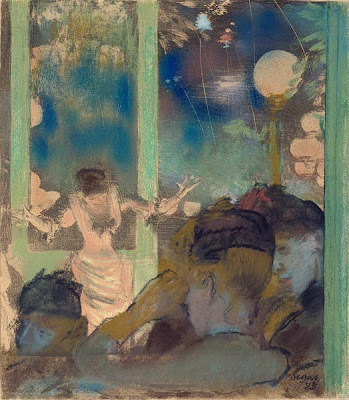 Though as superb in his use of color and light as any of his peers, linear divisions and precise draftsmanship always shaped Degas's canvases, unlike the softly billowing whirls of Monet or Renoir. His subjects were viewed with an almost clinical eye, and exacting observations of human or animal anatomy defined every figure. 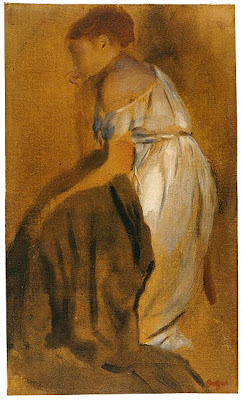 Study of a Seated Woman, 1868–69. Oil paint thinned with turpentine, over graphite, on tan paper. 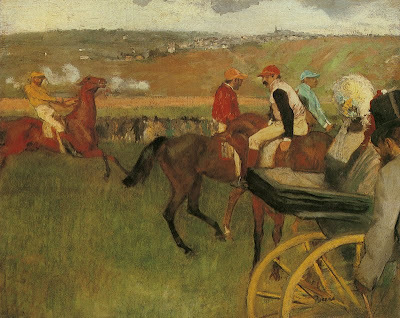 The unbridled joie de vivre found in much of Impressionist art is absent from his work. His interest was in the back-breaking rehearsals of the "little rats" in the corps de ballet, not in the star turns of the prima ballerina. 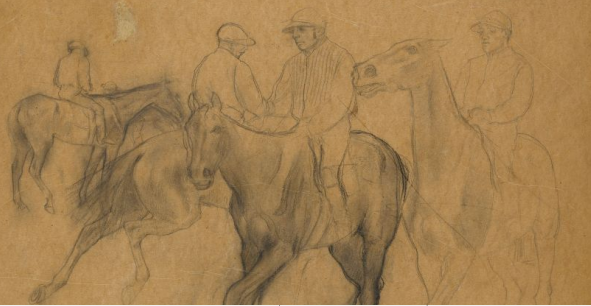 He depicted the tension and apprehension of horses and jockeys before a race, rather than the celebration in the winner's circle. Even his early self-portraits, two of which are featured in the Morgan show, are remarkable for their clear-eyed observation of a young gent with a too long nose and drooping eyelids. 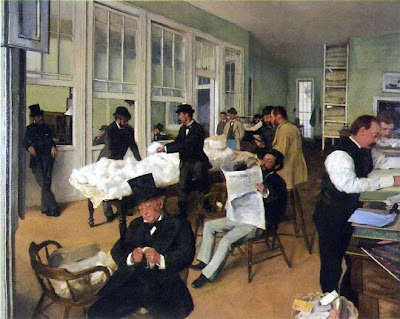 Photoshopping would never have been Edgar Degas's cup of tea. 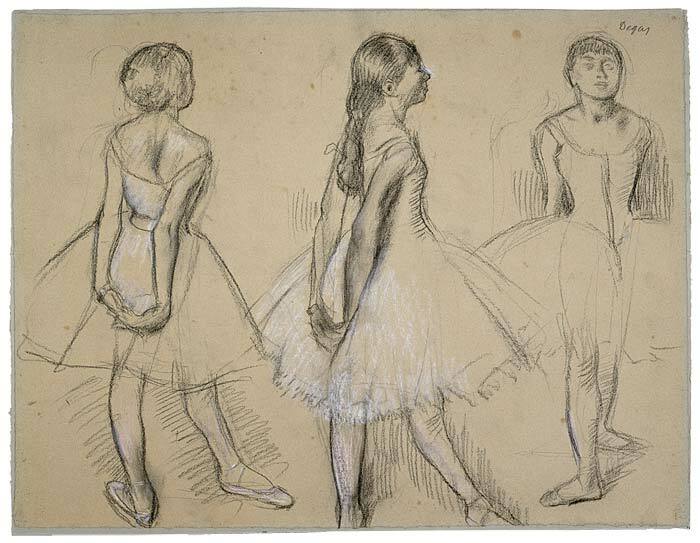 Although a small exhibition, the Morgan show, Degas: Drawings and Sketchbooks, spans over 40 years of the artist's career. 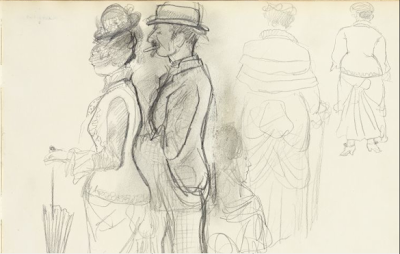 One of the sketchbooks here is from Degas's first trip to Italy as an art student, while the other is from a period marking the height of his fame as an established painter in Paris. The works on paper cover the years from 1856 through 1892, depicting the complete evolution of the artist's work over the years. "As a medium, drawing often provides a more personal and intimate glimpse of an artist’s creative process than either painting or sculpture, and the works on view in this exhibition are no exception," says William M. Griswold, director of The Morgan Library and Museum. Sketchbook, ca. 1880 and after. Contains 21 drawings on 43 leaves. and a few leaves executed in blue chalk; bound in tan linen. Edgar Degas was a notoriously secretive man, believing "the artist must live alone, and his private life must remain unknown." Misanthropic and difficult, he never married. He was more than a little snobbish, actively disdaining both Protestants and Jews, and politically extremely conservative. 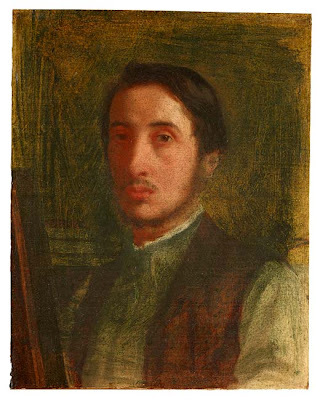 Aristocratic and independently wealthy, he often held back his completed paintings for years, exhibiting and selling them on his own idiosyncratic timetable. 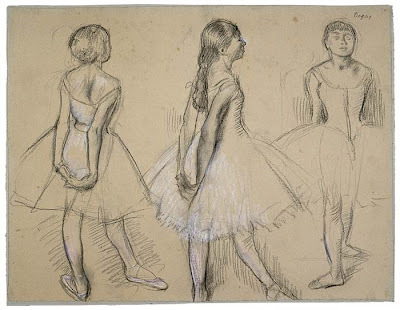 It is doubtful Degas would have approved of his raw sketches being displayed in public at all, much less in a museum gallery and an online exhibition open to a worldwide audience. But unlike learning the sleight of hand behind a dazzling magic trick, seeing the plotting and planning behind these great works doesn't spoil the effect. Knowing that they percolated for decades in the artist's mind only makes the viewer marvel all the more at the effortless illusion of Degas's finished masterpieces.